Every once and again, a producer takes a simple, appealing little idea and runs amok with it. The middle-1970s were largely the official stumbling block for “childrens movies” designed to offer gentle, non-hip entertainment. Now, even Disney-produced films can have touches of low humor and things that parents of the 1950s would take exception to. However, in 1959, there was still time for an unsophisticated storyline. The best years of Rankin-Bass lay ahead, and — down in Mexico — work was being completed on a slightly outre’ Christmas film. 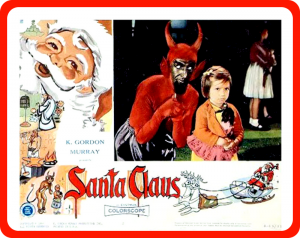 SANTA CLAUS emerges in the 1990s as a “party film,” simply on the merits of some of the more bizarre elements, which include the fabled Jolly Old Elf spying on unaware children with a sophisticated, wiggly telescope eye, a minor demon tormenting Santa with a toy missile launcher, and far more elfin magic than is good for you. In his castle (literally) in the clouds, Santa and a gaggle of “typical” children (a Mexican boy, a somewhat Germanic girl and an all-American cowboy Norte Americano) are busily getting the good on the unwary children of the world. In spite of a minor flaw with his mobile spy eye, Santo deftly homes in on a little girl who has no means to get that doll she’s been wanting. In the meantime, down in suburban Heck, the devil sends wicked, somewhat able Pitch to Earth to stonewall Santa’s Christmas dealings. Pitch is essentially warned that he’d better not screw this job up. At this point, I think we all see where all this is heading. Santo arrives on Earth in a vaguely sci-fi sleigh. He bedevils a couple of nasty boys who heckle the waif, and we see her tormented with guilt as Pitch tries to engineer her stealing of a doll. Of course, she instinctively does the right thing, which leaves Pitch at loose ends. Having been a wee bit short of the task of corrupting a 5 year-old child, he turns on Santa. There follow a few extremely humiliating scenes of the demon trying to do something significant.